ABSTRACT. Diet and food preferences of the green turtle Chelonia mydas were analyzed based on digestive tract contents of dead specimens caught incidentally by an artisanal gillnet fishery in Sechura Bay, northern Peru. We examined 27 digestive tracts and identified 35 prey items. The sampled turtles were all juveniles (CCL = 53.7 ± 1.2 cm, range 40.5-67.0 cm). The prey items were grouped into six categories: algae, cnidarians, mollusks, arthropods, chordates and garbage/anthropogenic debris. The items with the highest Frequency of Occurrence values (% FO) were: Caulerpa filiformis (77.8%), Loligo gahi (eggs) (51.9%) and Rhodymenia corallina (44.4%). By weight (% W), the most important items, were L. gahi (eggs) (33.3%), Stomolophus sp. (7.3%) and Aphosporosus (6.5%). According to the Preponderance Index (%IP), the preponderant item was L. gahi (eggs) with 6.1% and 61.2% during winter-spring and summer-autumn, respectively. According to the Resultant Weight index (Rw) of wet items, the most important items were: C. filiformis (13.1%), L. gahi (eggs) (10.5%), R. corallina (7.4%), plastic (7.5%), Gigartina chamissoi (5.1%). Garbage/anthropogenic debris was common in the digestive tracts analyzed. Plastic items had a frequency of occurrence of 44.4%. A greater diversity of food items was observed during summer and autumn. This study shows that juvenile C. mydas forage on a variety of resources. We recommend that conservation plans, land use planning and future management plans in the Sechura Bay include green turtles as a sentinel species for monitoring biodiversity of marine resources and the degree of pollution in the Bay. Keywords: diet, Chelonia mydas, Sechura, Peru, small-scale fisheries. From their emergence as hatchlings through to their adult life, sea turtles experience ontogenetic changes in habitat use that includes nesting beaches and juvenile and adult feeding areas (FAO, 2011). Currently, multiple sea turtle populations are declining (Amorocho & Reina, 2007; Carrión-Cortez et al., 2010), due largely to anthropogenic activities including commercial overfishing, bycatch, destruction of critical habitat for feeding and nesting; and most recently, pollution (Gilman et al., 2006, 2010; Boyle & Limpus, 2008; Rodríguez, 2010). The green turtle (Chelonia mydas) is a circumglobal species that is susceptible to overexploitation as a food resource, incidental mortality in fisheries (Alfaro-Shigueto et al., 2002), and coastal foraging habitat degradation, all of which have contributed to its listing as Endangered on the IUCN Red List (Lemons et al., 2011). The species is found year-round in shallow waters of coasts, bays and lagoons (Bjorndal, 1980; Plotkin et al, 1993), which are important habitats for growth and development (Musick & Limpus, 1997). C. mydas is distributed along the west coasts of North and South America (Marquez, 1990; Aranda & Chandler, 1989). Marquez (1990) reported coastal primary foraging areas from San Diego Bay, USA to Mejillones, Chile and more recently, the species' southward distribution was extended to Valparaíso, Chile (Troncoso-Fierro & Urbina-Burgos, 2007). Neritic habitats in Peru also form important feeding areas for the species (Alfaro-Shigueto et al., 2002, 2004; Velez-Zuazo et al., 2014). The feeding ecology of this species has been studied throughout most of its distribution (Quiñones et al., 2015a). At their juvenile developmental habitats, green turtles can take on a herbivorous diet, feeding primarily on seagrass and algae (Plotkin et al., 1993; Seminoff et al., 2002a, 2003; López-Mendilaharsu et al., 2005; Sampson & Giraldo, 2014). Other studies have noted that C. mydas juveniles can also be carnivorous consumers, foraging mainly on cnidarians (Carrión-Cortez et al., 2010), sponges (Seminoff et al., 2002b), and tunicates (Amorocho & Reina, 2007, 2008). Additional studies have also identified an omnivorous diet, based mainly on algae but with an additional wide variety of animals, such as crustaceans, fish eggs, mollusks, and, to a lesser extent, jellyfish (Hays-Brown & Brown, 1982; De Paz et al., 2004; Kelez et al., 2004; Santillán, 2008; Quiñones et al., 2015a, 2015b). The diet composition at different feeding grounds depends on the availability of resources (Bjorndal, 1980), and to some extent, by foraging preferences, especially for certain species of algae (López-Mendilaharsu et al., 2008). This feeding strategy, where juveniles are herbivorous/omnivorous, allows for accelerated growth of recruits (Quiñones et al., 2015a). In the Eastern Pacific Ocean (EPO), there is baseline diet information for some green turtle feeding grounds, including those located in the Baja California Peninsula (Mexico) (Seminoff et al., 2002a, 2003; López-Mendilaharsu et al., 2005), the Galapagos Islands (Seminoff et al., 2002b; Carrión-Cortez et al., 2010), and the Gorgona Island (Colombia) (Amorocho & Reina, 2007, 2008). 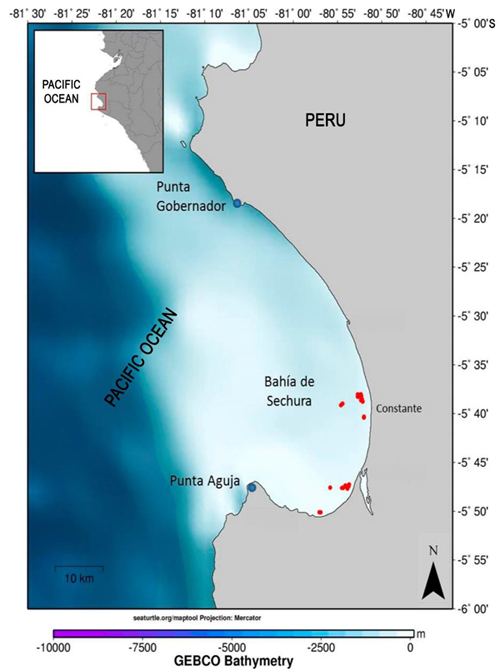 In Peru, C. mydas feeding grounds have been identified in Tumbes (Rosales et al., 2010), El Ñuro (Velez-Zuazo et al., 2014), Sechura Bay and Virrilá estuary (Santillán, 2008; De Paz & Alfaro-Shigueto, 2008; Paredes et al., 2015), Isla Lobos de Tierra (Quiñones et al., 2015a), Chimbote (Alfaro-Shigueto et al., 2004), Pisco (Hays-Brown & Brown, 1982; Quiñones et al., 2010), and the Paracas Bay area (Hays-Brown and Brown, 1982; De Paz et al., 2007; Paredes, 2015; Quiñones et al., 2010; Quiñones et al., 2015a, 2015b). Virrilá estuary and Sechura Bay are known to be important aggregation areas for juvenile and subadult green turtles (Santillán, 2008; Alfaro-Shigueto et al., 2011; Paredes et al., 2015; Ortiz et al., 2016). In addition to marine algae and seagrasses (Hays-Brown & Brown, 1982; Alfaro-Shigueto et al., 2004; Seminoff et al., 2002b; Amorocho & Reina, 2008), at many of these sites, green turtles consume large quantities of invertebrates (like scyphozoan jellyfish and sessile anemones) (Quiñones et al., 2010; Paredes, 2015), fish and mollusks. Sechura Bay is also an important and traditional site of small-scale fishing (Alfaro-Shigueto et al., 2010; Morón et al., 2013) for demersal and benthic resources. More recently, the bay has seen the development of mariculture, mainly of Argopecten purpuratus (Mendo et al., 2008; Mendo, 2011). Small-scale fisheries (SSF) are often poorly managed and also have generated environmental problems such as pollution (IMARPE, 2011), and impacts on endangered species, including sea turtles (Alfaro-Shigueto et al., 2011; Ortiz et al., 2016). The purpose of this research was to study the diet composition of juvenile and subadult green turtles in this bay, an area of particular importance as a foraging ground for the species in northern Peru, but also an area important for small-scale fisheries. Sechura Bay (05°12' to 05°50'S and 80°50' to 81°12'W) is delimited in the north by Punta Gobernador and Punta Aguja to the south, has an approximate extension of 89 km2 (IMARPE, 2007; Morón et al., 2013), and is within the Piura Region (Fig. 1). The study was conducted between July 2013 and June 2014 as part of a program to monitor the small-scale fleet operating from the port of Constante (05°35'S, 80°50'W). Fishing vessels ranged in length from 6 to 10 m and each trip consisted of setting of bottom set gillnets. Gillnets were made of multifilament twine and were composed of multiple net panes that measured 56.4 m long by 2.8 m high, with a stretched mesh of approximately 24 cm. Nets were typically deployed in the late afternoon, soaked overnight and retrieved the following morning (Alfaro-Shigueto et al., 2010; Ortiz et al., 2016). We collected digestive tract contents from dead specimens of C. mydas incidentally caught in this fishery. Each turtle was measured for the curved carapace length (CCL cm) from the anterior notch to the tip of the posterior-most marginal scutes (Bolten, 2000; Wyneken, 2001). 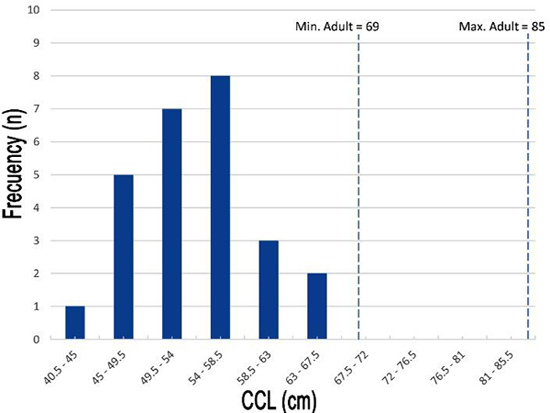 Individuals with CCL < 69 cm. were considered as juveniles, individuals with 69 ≤ CCL < 85 cm. were considered as sub-adults, and individuals with CCL ≥ 85 cm. as adults (Zárate et al., 2013). All digestive tract contents were collected and stored in 10% formaldehyde in seawater solution (Jacobson, 2000; Work, 2000; Wyneken, 2001). The identification of categories and items was made with the help of identification guides reaching the lowest possible taxonomic level. Prey species identification guides used included Chirichigno (1974), Mendez (1981), Alamo & Valdivieso (1997), Acleto & Zúñiga (1998), Chirichigno & Cornejo (2011), Moscoso (2012, 2013), Tume et al. (2012) and Guiry & Guiry (2015). where: Pi = total wet weight of diet item in all samples; Pt = total wet weight of all samples; Ni = number of samples containing diet item; Nt = total number of samples. where: %FO = frequency of occurrence percentage; %W = weight percentage. The Resultant weight index (Rw) can be graphically represented as a function of the θ° angle. This index allows one to interpret the importance of each item considering the values of %W and %FO. Items with a uniform representation of %W and %FO have angles close to 45°. The values of the Rw vary between 0 and 100. Items with values close to 100 represent the most important item in the diet (Mohan & Sankaran, 1988; Carrion-Cortez, 2010). We examined 27 digestive tracts of C. mydas. The sampled specimens were 100% juveniles (CCL = 53.7 ± 1.2 cm, range 40.5-67 cm) (Fig. 3). The largest number of digestive tracts collected were in the summer (January-March) and autumn (April-June), with a total of 12 and seven digestive tracts, respectively. Four digestive tracts were collected in both the winter (July-September) and spring (October-December). 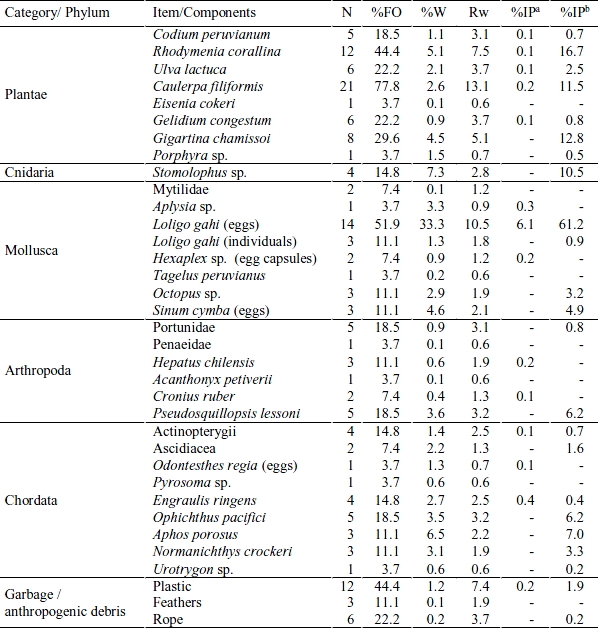 Thirty-five food items were identified and grouped into six categories: algae, cnidarians, mollusks, arthropods, chordates and garbage/anthropogenic debris (Table 1, Fig. 2). Of all items identified, five had the highest frequency of occurrence (% FO): Caulerpa filiformis "thread-like algae" (77.8%), Loligo gahi "common squid" (eggs) (51.9%), Rhodymenia corallina "rose seaweed" (44.4%), Gigartina chamissoi "tongue-weed" (29.6%), and Ulva lactuca "sea lettuce" and Gelidium congestum "jelly-weed" (22.2% each). By weight (% W), green turtles consumed mainly five food items: L. gahi (eggs) (33.3%), Stomolophus sp. jellyfish (7.3%), Aphosporosus "monkfish" (6.5%), R. corallina (5.1%), and Sinum cymba (eggs) (4.6%). Sechura Bay, 2013-2014 (n = 35). tracts of C. mydas from Sechura Bay, 2013- 2014. Figure 3. Size-classes of C. mydas captured in the Sechura Bay, 2013-2014. (Source: Galapagos Islands size data). According the Preponderance Index (%IP), during winter-spring, the only preponderant item was L. gahi (eggs) (6.1%), while during summer-autumn the preponderant items were L. gahi (eggs) (61.2%), R. corallina (16.7%), G. chamissoi (12.8%), C. filiformis (11.5%) and Stomolophus sp. (10.5%) (Table 1). Prey items found varied seasonally (Table 2). The three most important items by season according to the weighted resulting index (Rw) were: L. gahi (eggs), Hexaplex sp. "rock snail" (egg capsules) and Hepatus chilensis "crabs" in winter; C. filiformis, L. gahi (eggs) and Cronius ruber "blackpoint sculling crab" in spring; C. filiformis, L. gahi (eggs) and R. corallina in summer; and L. gahi (eggs), R. corallina, G. chamissoi and Pseudosquillopsis lessoni "mantis shrimp" in autumn. Debris from anthropogenic activities, such as nylon monofilament, rope, and plastic bags, was common in the digestive tracts analyzed (56%). Within these garbage/anthropogenic debris items, plastic bags were the most common, with a FO of 44.4%. percentage (%W) and weighted resultant index (Rw) by seasons. N = number of digestive tracts by seasons. 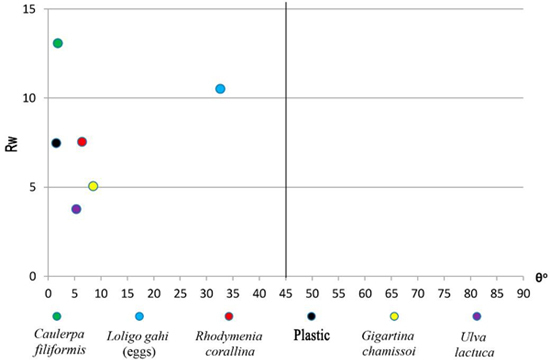 The degree of importance of preys consumed by C. mydas for the study period, according to the weighted resulting index (Rw) in decreasing order was C. filiformis, L. gahi (eggs), R. corallina, Plastic, G. chamissoi and U. lactuca (Fig. 4). and less %W; close to 90°: high %W and less %FO). The green turtle uses the Peru coast mainly as a foraging ground (Hays-Brown & Brown, 1982; Santillán, 2008; Quiñones et al., 2010, 2015b; Paredes et al., 2015). Bays along the coast offer protection and food resources for juvenile green turtles (Hatase et al., 2006; Vander et al., 2013). Sechura Bay and Paracas Bay are two areas identified in past studies as green turtle foraging areas (De Paz & Alfaro-Shigueto, 2008; Santillán, 2008; Cáceres et al., 2013). These bays have similar characteristics, such as shallow water and abundant algae and seagrasses that provide habitat for invertebrates, fish and mollusks (Paredes, 2015). The size distribution of green turtles captured in Sechura Bay in this study corresponded to an immature population consisting of juveniles (100%). Our results suggest that this bay is likely to harbor juveniles almost exclusively. This may indicate that small green turtles spend more time in nearshore areas than larger sized individuals (Carrión-Cortez et al., 2010). Smaller turtles have higher relative energy demands than adults (Koch et al., 2007; Carrión-Cortez, 2010), and have been shown to prefer sheltered areas where net energy expenditure during foraging activities is less than in high-energy oceanic zones (Seminoff et al., 2003; Koch et al., 2007; Santillán, 2008). Research conducted in Baja California (Mexico) indicates that the green turtle has an herbivorous diet, feeding on red algae, green and seagrass (Seminoff et al., 2002a, 2002b; Koch et al., 2007; López-Mendilaharsu et al., 2008). This trend toward algae and/or sea grasses has also been well documented in adult green turtles in the Caribbean (Bjorndal, 1980). On the Pacific coast of South America, direct observations in the Galapagos Islands of sub-adult and adult green turtles indicated that they predominantly fed on algae, including Ulva, Padina, Gellidium and Gracilaria spp. (Green, 1994). Sampson et al. (2013) found in esophageal lavages of C. mydas juveniles at Gorgona National Park that the most abundance items were Povillopora damicornis, rhodoliths, Cladophora sp. and algae mats. However, in coastal waters of Peru, Hays-Brown & Brown (1982) in Pisco, found a significant amount of animal prey items (mollusks, polychaetes, jellyfish, amphipods, sardines and anchovies) in the stomach contents of sub-adult and adult green turtles, in addition to algae. In San Andres (Pisco), Quiñones et al. (2010) found in the stomach and esophagus of C. mydas that jellyfish was the most consumed prey item, followed by mollusks and macro-algae. This feeding behavior is similar to the present study, where C. mydas shows an omnivorous diet, composed mainly of items of animal origin (68.6%). Early studies of the diet of C. mydas suggested macroalgae as their main prey item (Bjorndal, 1997), with the genus Codium and Rhodymenia extensively reported as diet components (López-Mendilaharsu et al., 2005; Rodriguez, 2010). In Paracas, De Paz et al., (2007) reported algae consumption of the genus Ulva in greater proportion. Our analysis reported algae consumption in all seasons, including Caulerpa filiformis, Rhodymenia corallina, Codium peruvianum and Ulva lactuca. The most important of these according to the Resultant Weighted Index was C. filiformis (Rw= 13.1%). Santillán (2008) analyzed 11 stomach contents from Sechura Bay and reported the highest values of frequency of occurrence for Gracilaria sp. (37.8%), C. filiformis (35.6%), Codium sp. (33.3%), and eggs of Loligo gahi (22.2%). Quiñones et al. 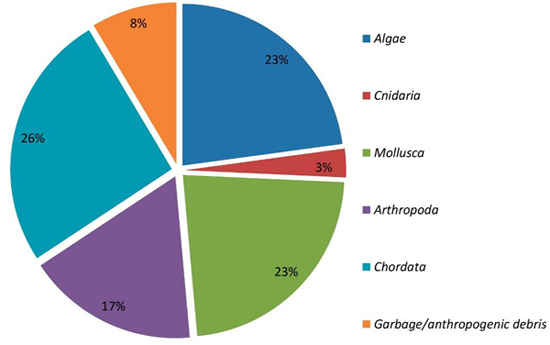 (2010) found in 192 stomach and esophagus samples from San Andres (Pisco) that the most frequently consumed prey items were jellyfish (70.8%), mollusks (62%), crustaceans (47.4%) and macroalgae (37.5%). Our study also reports C. filiformis (74.2%) and L. gahi (eggs) (48.4%), but both at approximately twice the frequency reported by Santillán (2008). Alfaro-Shigueto et al. (2004) examined 11 stomach contents from Chimbote Bay, and in seven found fish eggs, squids, Engraulis ringens "anchovy" and brachiopods. Hays-Brown & Brown (1982) analyzed 39 stomach contents and reported the occurrence of fish in 23% (mainly sardines, anchovies and fish eggs). Santillán (2008) also reported the presence of engraulids, especially serranids and carangids. In the Virrilá estuary in Sechura Bay, Quiñones (Pers. comm.) found great percentages of fish like Mugil cephalus "mullet" and a smaller percentage of Anchoa nasus "white anchovy" in stomach contents of green turtles. Our results indicate a %FO of 59.3% for fishes. This includes both bony fishes like E. ringens, elasmobranchs of the genus Urotrygon "round ray" and fish eggs from Odontesthes regia "silverside". This indicates that consumption of fish is important in the diet of C. mydas. Invertebrates comprised 43% of the total abundance of items in the stomachs analyzed here. Some invertebrates were found only once (Aplysia sp. "sea slug" and Tagelus peruvianus "saltwater clams") and did not warrant consideration as a major diet item (Rw = 0.85 and Rw = 0.62 respectively). Hays-Brown & Brown (1982) found crustaceans in five of 39 stomach contents examined, representing a %FO of 13%. Likewise, Alfaro-Shigueto et al. (2004) found crustaceans (Hyperia medusarum, Euphylax dovii) in four of 11 stomach contents analyzed. In our study, Crustacea was reported for 14 digestive tracts (51.9%), consisting mainly of Pseudosquillopsis lessoni and Portunidae. This represents FO values of 18.5% each, but only P. lessoni had a value as weight (3.5%). In another part of their investigation, Hays-Brown & Brown (1982) found mollusks (%FO = 64%), mainly Nassarius, Mytilus and Semele in 25 stomach contents. Alfaro-Shigueto et al. (2004), found Nudibranquia eggs, Aplysia sp., Sinum cymba, Chione sp., Natica sp., Nassarius grayi, Mactra sp., Semimytilus algosus and other mytilids in 10 of 11 stomach contents analyzed. In our research, mollusks were found in 18 digestive tracts (66.7%). High FO and weight values were found for eggs of L. gahi (51.9% and 33.3% respectively), followed by eggs of S. cymba (11.1% and 4.6% respectively). A study in Magdalena Bay (Mexico) reported changes in prey diversity in juvenile turtle diets which coincided with seasonal changes in vegetal biomass (López-Mendilaharsu et al., 2008). Similary, Santillán (2008) reported that the herbivorous diet would predominate during spring and summer, while the carnivorous diet would increase during autumn and winter. Our results show that green turtles consumed L. gahi (eggs) throughout the year but, mainly during summer-autumn (%IP = 61.2%). This could be due to their seasonally high abundance in Sechura Bay (IMARPE, 2007) which in turn could be explained by the L. gahi (eggs) spawning seasons which peak in spring or early of summer and autumn (Villegas, 2001). It has been suggested that the dominance of some food items over others could be related to increased algae abundance and that algae are the habitat of diverse organisms favoring their proliferation (Paredes, 2015; Gribben et al., 2009). Box (2008) stated that algae from the Caulerpa genus favors the growth of various organisms, mollusks in particular. Our work provides support for this assertion because C. filiformis and L. gahi (eggs) were mostly found in the same samples. 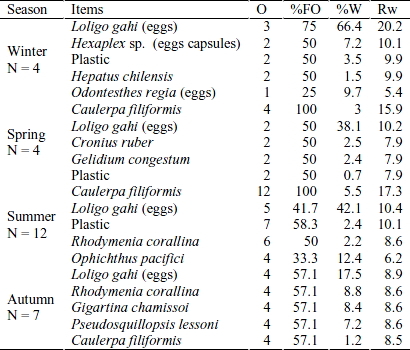 Both items had high Resultant Weighted Index values (Rw) (C. filiformis = 13.1% and L. gahi (eggs) = 10.5%), and were the most important items in the C. mydas diet observed in our study. During winter-spring, according the Preponderance Index (%IP), the only preponderant item was L. gahi (eggs) (6.1%), while during summer-autumn the preponderant items were L. gahi (eggs) (61.2%), R. corallina (16.7%), G. chamissoi (12.8%), C. filiformis (11.5%) and Stomolophus sp. (10.5%). This could be due, because during winter-spring the green turtle individuals go somewhere close like Virrila estuary to feed on great percentages of M. cephalus "mullet", Ulva spp. and A. nasus "anchovy white" (Paredes, unpubl. data) whereas during summer-autumn go out of estuary to feed of mentioned items. In the present study, 55.6% of digestive tracts analyzed contained garbage and/or anthropogenic debris. The materials found include: plastic (bags/ packing) and rope the majority of which was found in the final portion of the intestine. Marine debris is a growing problem for wildlife. It has been documented to affect more than 267 species worldwide (Schuyler et al., 2012) and can have lethal and sub-lethal effects on sea turtles and other wildlife (Schuyler et al., 2013). The occurrence of debris from anthropogenic activities (especially plastic bags) in digestive tracts of C. mydas has been reported since the 1980's (Schuyler et al., 2012). In Peru, a study from Chimbote reported plastic bags and traces of nylon in 91% of stomach contents analyzed (Alfaro-Shigueto et al., 2004). In Sechura, Santillán (2008) reported that green turtle stomach contents contained approximately 26.7% plastic debris. The high incidence of garbage and anthropogenic debris found in green turtles in our study may reflect the pollution of areas within the bay due to human presence and activities (e.g., coastal community proximity, mariculture area, fisheries). Our results highlight the importance of neritic habitats, especially bays, as key habitats for the development of juvenile and sub-adult green turtles in the Eastern Pacific Ocean. Juvenile of C. mydas in Sechura Bay had an omnivorous diet and foraged on a variety of resources, but mainly on animal prey items like mollusks, arthropods and chordates. They did not appear to focus on any particular prey species. Future research could include a detailed assessment of the composition of species in the benthic areas of Sechura Bay, including their spatial and temporal distributions. Future use and development of bay areas, including of Sechura Bay, should take into account the vital role these habitats play in the development of juvenile green turtles. We recommend conducting complementary studies to characterize and quantify marine debris and formulating management plans toward reducing plastics pollution in Sechura Bay. Species like the green turtle can also be used as sentinels for biodiversity and pollution within bays and coastal areas. We would like to thank the fishing communities who participated in this study. Our thanks also to biologists Armando Ugaz and Humberto Rivera (National University of Piura), David Montes (Ricardo Palma University) for their generous support during the project and for their help in identifying the samples collected. We also want to thank ProDelphinus staff for their help in data collection. This study was conducted with support from the National Fish and Wildlife Foundation (NFWF), Whitley Fund for Nature (WFN), Darwin Initiative - Sustainable Artisanal Fisheries Initiative in Peru (DEFRA), University of Exeter and ProDelphinus NGO. Jacobson, E. 2000. Toma de muestras de tejidos y técnicas para la necropsia. In: K. Eckert, K. Bjorndal, F. Abreu-Grobois & M. Donnelly (eds.). Técnicas de investigación y manejo para la conservación de las tortugas marinas. Traducida al español. UICN/CSE Grupo Especialista en Tortugas Marinas, 4: 246-250. Musick, J. & C. Limpus. 1997. Habitat utilization and migration in juvenile sea turtles. In: P. Lutz, J. Musick & J. Wyneken (eds). The biology of sea turtles 1. CRC Press, New York, pp. 137-163.